We have established a sound and commodious infrastructure at Ahmedabad, India. It is managed by a team of highly experienced professionals, which ensures systematic execution of all the processes. Moreover, it is segregated into three major departments-manufacturing, quality control and warehousing & packaging. The manufacturing facility is the backbone of our infrastructure and outfitted with all the requisite equipment and technologies that ensure minimum wastage of the resources and also reduce the fabrication time. In addition, inspection of these departments is timely done, in order to ensure smooth execution of all the operations. The R & D wing is an integral part of our firm. It comprises highly adept research and development associates, who are also backed by relevant experience. These professionals conduct extensive market research, in order to keep themselves abreast of all the advancements occurring in the field of science & technology. Moreover, they also conduct surveys at regular intervals of time, in order to understand the myriad business requirements of the elite clients. 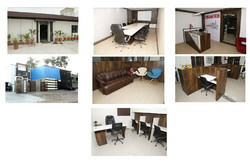 We have been able to upgrade the quality and design of our products, owing to their dedicated and consistent efforts. We have established a sound and commodious infrastructure at Ahmedabad, India. It is managed by a team of highly experienced professionals, which ensures systematic execution of all the processes.